Navajo Mountain (Naatsis’áán, or “Earth Head” in Navajo), is one of the six sacred peaks to the Diné. In local tradition, it represents the head of the War God, and women are traditionally forbidden to climb it. A species of penstemon, the Navajo Mountain beardtongue, grows exclusively on the upper slopes of this 10,300-foot-tall peak. From a distance, Navajo Mountain looks like a smooth bubble in the earth. It's easy to see why local tradition describes it as the War God's pillow. The closer you get, however, the more rugged the landscape becomes. From high points on U.S. 98, the true nature of the country stretching out from the sacred peak becomes apparent: a hellish labyrinth of gorges and rock formations. It's easy to see how the Navajos here escaped the Long Walk by hiding from the cavalry in this maze. Even today, you have to know your way around if you want to hike here without getting lost or falling off a cliff. Over the years, the area has hidden more than the Diné who fled from Kit Carson's roundup. Navajo Mountain Chapter Vice President Jaime Holgate's family came here three generations ago, fleeing the law. Holgate's great-uncle was Daghaa Chii Iskhinii ("Red Whiskers Killer"), the man who shot and killed the Mormon settler Lot Smith at his ranch in Tuba City on June 29, 1892. The way Holgate heard the story from his grandmother, some sheep belonging to Daghaa Chii Iskhinii (who was then known as Nez Tsosie) had wandered into a canyon Smith had fenced off for his dairy cattle. In retaliation, Holgate said, Smith started shooting his great-uncle's sheep. "After that," he said, "my uncle started shooting Lot Smith's dairy cattle." It wasn't long before the men turned their guns on each other. The two shot at each other and missed; Tsosie's second bullet caught the Mormon in the leg. The Diné high-tailed it out of the canyon on his horse. "My grandmother went to his (Smith's) house to see if she could help out," Holgate said. "They had Lot Smith laid out on a table. There was a lot of blood. Some of his eight wives were tending to him, trying to stop the bleeding. They all turned and looked at my grandmother." When Granny came home and told the family it looked like Red Whiskers was about to breathe his last, Tsosie wasted no time. "He had a friend up here," Holgate said. "He packed up his family and moved them to Navajo Mountain." The territorial authorities eventually caught up with Daghaa Chii Iskhinii and packed him back to the territorial court in Prescott, where the judge promptly acquitted him on grounds of self-defense. But by that time, the family had decided they preferred the quiet environs of Navajo Mountain to the overgrazed flats of Tuba City, and decided to stay. Today, Navajo Mountain Chapter, which just this month voted to formally change its name to Naatsis'áán (Earth Head, the Navajo name for the 10,400-foot-tall peak), is still a good place to get away from it all. It's slightly less remote than it used to be with the paving of the last 15 miles of N16 in 2008, but is still arguably the most remote chapter on the Navajo Nation. It's a good two hours from Flagstaff, the nearest city of any size, and two-and-a-half from either Tuba City or Kayenta, Ariz. A drive to Window Rock takes half a day. Only about 30 percent of the chapter's residents have electricity and running water, Holgate estimated. If you want to make a call on your cell phone, you have to drive to the landing strip, the only place in the chapter that gets decent reception. "We rely on Neighborhood Watch," said the chapter's secretary-treasurer, Ella Badoni. This time of year, says Postmistress Lillian Graymountain, people are stocking up for the winter. "Everybody's stockpiling wood, food and hay," she said. "That way if we get stuck for the winter, we're OK."
The San Juan Southern Paiute tribe is negotiating with the Navajo Nation to withdraw land at the base of Navajo Mountain for a reservation of their own. Name: According to Chapter Vice President Jaime Holgate, the 10,388-foot-tall peak that dominates the landscape was named Navajo Mountain by geologist and explorer John Wesley Powell. The local Paiutes refer to it as Paiute Mountain, and Navajos call it Naat sis'áán, "Earth Head," because it represents the head or the pillow of the War God. (To see a video of Holgate telling the story of Naat sis'áán, go to http://www.youtube.com/watch?v=H7QUEJOeFRQ.) The chapter is in the process of changing its name to Naat sis'áán. Clans: Tó Díchíinii, 'Ashíihí, Táchiinii, Tl'ízí Lani, Hashk'aa Hadzoho, Kin Yaa'áanii, Bit'ahnii and two indigenous to this area: Kis'ani'Ashíihí (Hopi Salt) and Báyoodzin 'Ashíihí (Paiute Salt). According to Holgate, the Hopi Salt Clan, also called "Pumpkin Salt," came about because of intermarriage, and the Paiute Salt when a Paiute trader traded a girl child to a member of the Salt Clan for provisions when he ran out of things to trade. Problems: Isolation; this is the most far-flung of Navajo chapters and received its first paved road in 2008. The countryside is extremely rugged and hard to develop. Assets: Good farm land, tourism potential. There are long-running rumors of gold in the canyons. 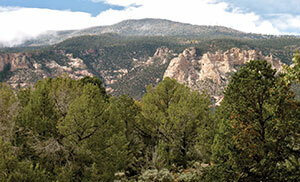 By virtue of its remoteness, Navajo Mountain has stayed traditional. You still hear more Navajo here than English, and according to Badoni, the people segregate themselves by gender at the chapter meetings, with the men on the right side of the aisle and the women on the left. "If somebody sits on the wrong side," she confided, "you know they're not from around here." It could be argued that the chapter is actually more remote now than it was in the 1910s, when Rainbow Bridge was declared a national monument. Before Lake Powell was filled in 1963, the only way to get to the astounding stone arch was via one of two extremely rugged 14-mile trails from the vicinity of what is now the chapter compound. Tourists stayed at a six-room hotel owned by the family of former U.S. Sen. Barry Goldwater, and rode to the bridge on horseback. The bottom dropped out of that market when the lake was filled and tourists could get to the bridge by motorboat. Wayward tourists still wander into the chapter house and inquire of Graymountain how to get to Rainbow Bridge or Monument Valley. "I tell them there's no road," she said. "Sometimes they don't believe me. They show me a road on their GPS. I don't know if the GPS is showing a road that used to be there, or a road that was planned at one time and never built." Believe the chapter officials: There's no road. "Even to get from here to Monument Valley on horseback," Holgate said, "You'd want a horse that was born and raised here." There is a road to Oljato, Utah, on the drawing board, which would literally be a lifeline to the hospital in Blanding, Utah. There is, however, a clinic in the chapter, run by the Utah Navajo Health System. Two doctors fly in every day. There's also a high school, thanks to the efforts of a group of students and parents who sued the San Juan School District in 1973 for equal access to education. The litigation went on for more than two decades and was finally settled in 1996 -- thanks, Holgate says, to Rainbow Bridge. Holgate, who was chapter president at the time and a party to the lawsuit in U.S. District Court for Utah, said U.S. District Judge Bruce Jenkins pulled him aside at one point and told him he had taken the horseback tour to Rainbow Bridge years earlier and developed a soft spot for the remote community at Navajo Mountain. "'Don't you worry,' he told me," Holgate recalled." 'You'll get your school.'" It was that very year a high school was set up in a portable classroom, and two years later they had a building. Currently, 47 students attend Navajo Mountain High; it has a capacity of 60. With special permission, parents can choose to send their students across the state line to larger high schools in Tuba City or Kayenta, but the chapter officials agree that, for its size, Navajo Mountain is a darned good school. Due to an agreement with the College of Eastern Utah, students here can take college-level courses and get a jump-start on their higher education, Holgate said, and Badoni added that there are actual college classes offered at the school via satellite for those who want to continue their education after they graduate. Tiny class sizes, sometimes as few as five students, ensure the kids get plenty of one-on-one time with their teachers. But all is not well in this isolated Eden of Navajo chapters. The officials are still reeling from a tribal audit this past spring that discovered the community services coordinator had made off with $129,000 in chapter funds, writing checks to herself and submitting falsified records to the administration. Just last Thursday, while the Times was there, the officials hired a new CSC -- the only applicant for the job. The chapter will be laboring under a corrective action plan for the next year or so, during which development will have to be curtailed while the chapter gets its books in order. However, a water line extension that's already in progress will be completed, and the chapter hopes to lure in a convenience store, now that power and water are available at the proposed business site. Tourism seems like an obvious way to develop economically, but the traditional folks here are protective of both Naat Sis'áán -- which, traditionally, you're not supposed to climb unless you're going to pray for rain, and women aren't supposed to climb at all -- and Rainbow Bridge, which you're not supposed to walk under. According to Holgate, one local resident tried to revive the horse tours, and was told by the National Park Service he'd have to find a way to pack out any manure the horses dropped within the confines of the monument. So, for now, this extraordinarily lovely chapter remains what it has always been: a good place to hide.